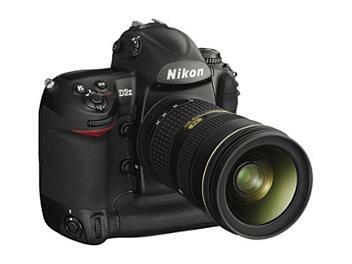 Flagship 24.5-megapixel FX-format D-SLR meticulously engineered for professionals whose work demands extreme resolution, file size and image fidelity. Large 5.49 um pixels capture astonishing detail and subtleties with outstanding dynamic range for demanding commercial applications. Commercial image quality teams with speed and handling to create new shooting possibilities in the studio or on location. Two Nikon-exclusive technologies provide intelligent auto exposure capabilities, along with refined auto white balance detection and faster, more accurate AF performance. Four preset options: Standard, Neutral, Vivid and Monochrome, and 9 customizable settings provide advanced, personalized color control. Effectively protected from invasive dust, moisture and electromagnetic interference with a self-diagnostic shutter mechanism tested to 300,000 cycles. Self-timer: Electronically controlled timer with duration of 2, 5, 10 or 20 sec. To handle this camera you must have had previous high quality SLR's. It's on the heavy side ,but how versatile!It takes the sharpest pictures for any magnification. To get it's true value use good AF lenses, preferably from the same maker.I'am still learning myself to experience it's full capabilities. All this of course comes with a price!